On Saturday, I headed into Birmingham’s city center for the cheap market of fresh produce. Busses in this city can be unreliable and I found myself waiting with little to do for twenty minutes at the bus stop about a five-minute walk from the university. Casting my gaze around aimlessly, a small quirky monument across from the bus stop caught my eye. Lightened in Photoshop to make up for the general lack of sunshine in England. 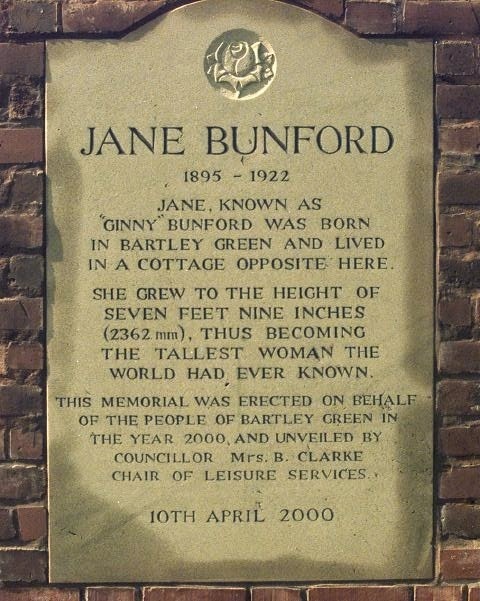 The monument was dedicated to Jane Bunford, the tallest woman ever born. The description is situated in a wall seven feet, eleven inches tall, Bunford’s height. Bunford was a fascinating giantess, but even more remarkable are the events which occurred after her death. 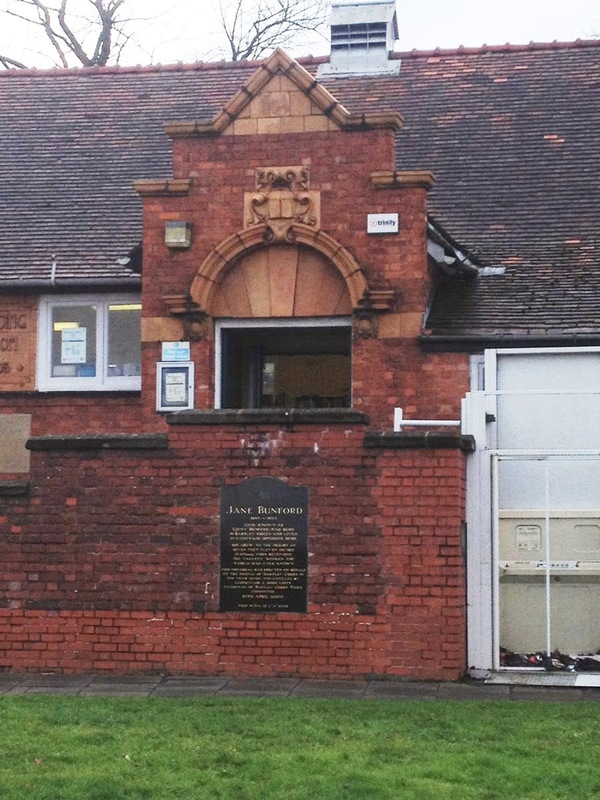 Jane “Jinny” Bunford (1895-1922) started life as a normal child in Bartley Green, a suburb of Birmingham, England which also contains my university. Tragedy struck before puberty. Bunford fell from her bike and hit her head, probably damaging her pituitary gland. She grew and grew and grew. While the wall said she was 7’11”, she would have appeared no higher than 7’8”. Bunford suffered severe spinal curvature from a lifetime of stooping through doors and scoliosis. Instead of accepting offers of easy money in carnivals or publicity tours, Bunford eschewed fame. She chose to make a living in the Cadbury factory (which was also founded in Birmingham). She never married, but often watched neighborhood children. Kind and gentle in demeanor, people liked the Giantess of the North. No photographs, if any still do exist of her, have ever been seen by or shown to the general public. 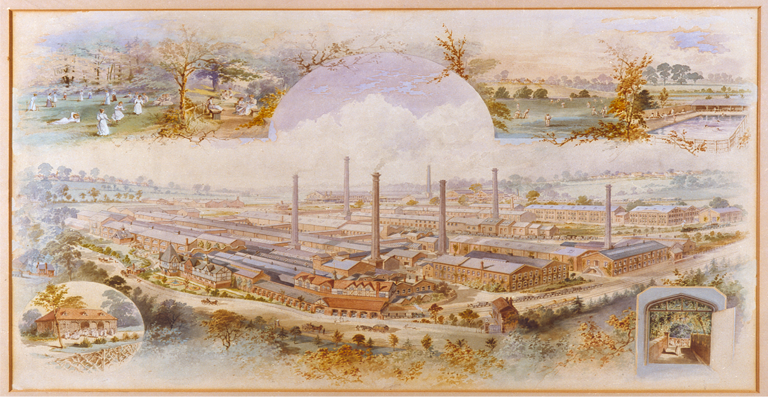 A portrait of Bournville, England, built as a Cadbury factory. George Cadbury wanted to build a place full of green spaces, where industrial workers could thrive away from city pollution. Like many with hyperactive pituitary glands, Jinny Bunford died young. At the end of her life, she was in a great deal of pain from her joints and spine. Guinness listed her as the tallest woman ever born when she died, a record left unbroken until the mid-1980s. Interestingly enough, she also had the record for the longest hair. Bunford’s auburn mane hung to a grand height of over eight feet. It is after her death Bunford’s tale becomes a bit strange, which considering she was a giantess is saying a great deal. In the early 1970s, the public became aware via an investigation by the Guinness Book of World Records that Queen Elizabeth Teaching Hospital, part of the University of Birmingham, had the skeleton of a female giantess. People started asking who it was and how the university acquired the corpse. The university released information saying the giantess’ identity was unknown but gave general measurements and said that she had died age 25 in 1921. The details were a bit off, but after some investigative digging, journalists realized Bunford was the only giantess in that area at the time. Worse, they found her coffin empty. It is unclear how the university obtained Jinny’s body. She did not leave her body to science. One relative, Barry Jones, claimed her father sold the body, but John Bunford died almost a decade before Jinny did. Her two siblings at the time died before the scandal was unearthed. Unfortunately for Jinny, her story was still not over. The University was able to keep ownership over Jinny’s body for decades after the truth came out. In 2004, Barry Jones wrote, “Under the current data protection act I or any other relative are not allowed access to see the skeleton [as] it [is] being used for medical purposes but from 1 Jan 2005 the act changes and I have already presented my request for access and to possibly bury her skeleton in the family plot as I feel medical science has had her long enough.” Bunford’s family got their wish and she is now buried in an unmarked plot. Finally, there is some interesting controversy over the plaque which brought Bunford’s story to my attention. It was erected in 2000 under great attack by some members of Bunford’s family. Headed by George Andrews, Bunford’s elderly first cousin, they objected on the grounds that, “this is not what Jane or her family would have wanted.” The proponents of celebrating the giantess’ life won out and they installed the monument, albeit with the erroneous statement that Jane Bunford was the tallest woman ever born, instead of the tallest woman ever born in Britain.